It's time for the final lesson in our series, and the last instalment of our soap opera. Listen to the lesson to find out what comes of our friends in the Wohngemeinschaft, and whether Phillip and Hanna ever get together! As usual, the episode is rich in complex German and Andrea is on hand to help you understand everything. We hope you've enjoyed this series! This season of Coffee Break German features a total of 40 episodes, published every two weeks. Lessons 21-40 will be published during 2018. Stay subscribed to the podcast to enjoy each episode. If you'd like to benefit from lesson notes, bonus audio recordings and video versions of the lessons featuring 'synchronised video flashcards' to help you understand how the words and phrases are written, you can access the premium version of Coffee Break German on the Coffee Break Academy. Don't forget to follow Coffee Break German on Facebook where we post language activities, cultural points and review materials to help you practise your French. Remember - a few minutes a day can help you build your confidence in the language. Access the Coffee Break German Facebook page here. If you'd like to find out what goes on behind the scenes here at Coffee Break Languages, follow @coffeebreaklanguages on Instagram and check out our videos for language learners on YouTube. Find out all you need to know about Coffee Break German at http://coffeebreakgerman.com. CBG 2.39 | Wie viele Punkte muss man haben, um zu bestehen? We're back with another episode of Coffee Break German, the penultimate lesson of this season, and the penultimate instalment of our soap opera. This week Carola and Hanna are stressed about their exam preparation and enlist the help of their friend Sybille. Carola also has some words of wisdom to share with Hanna following the latest meeting with Phillip and Alex. As usual, this episode provides plenty of opportunities to investigate interesting language, including some tricky aspects of grammar! CBG 2.38 | Was ist denn passiert? Hier ist überall Polizei! In this latest episode of Coffee Break German, Alex has to deal with a break-in at the Pub this week and is being interviewed by a police officer. This gives us the opportunity to hear a different style of German, and we'll also be looking at the verb werden in detail. As usual, Andrea is on hand to explain everything. CBG 2.37 | Philip sitzt ja dort wie ein Häufchen Elend! It's time for another episode of Coffee Break German, and another instalment of our soap opera. This time we're joining Carol, Miriam and Philip at the party where Philip is hoping to get to know Hanna a bit better. But will the arrival of Alex put a spanner in the works? As ever, the episode provides lots of opportunities to experience new and interesting vocabulary and grammar points in German, and Andrea guides us through any difficult language included. In our latest episode of Coffee Break German we're continuing our soap opera and joining Carola, Hanna and Miriam on a shopping trip. The dialogues provide an opportunity to look closely at a number of interesting language points, including the use of adjectives as nouns and the use of nouns as verbs! Andrea is on hand to explain everything to Mark and to our learners. In this episode of Coffee Break German, the flatmates in our Wohngemeinschaft are organising a party for Carola's birthday and they're looking for the perfect location to hold the party. As usual, Andrea is on hand to help Mark and you understand everything in the conversation. In the latest instalment of our soap opera Carola, Miriam and Phillip receive an important letter and have to decide what to do in response. This episode will allow us to experience a more formal type of written German, and Andrea is on hand to explain everything to Mark and to our listeners. In this lesson you'll listen to the latest instalment of our soap opera in which we get to know a new character, Carola's friend Hannah. She and Phillip hit it off immediately. Andrea is on hand to help Mark - and you - understand the tricky aspects of the language contained in this episode. In lesson 32 of Coffee Break German Season 2, you'll listen to the next instalment of our soap opera. In this episode Phillip is looking for a part-time job and Miriam suggests that he tries to find a job in a local pub. We also meet Alex who works in the pub. Having listened to the radio play, you'll hear Mark and Andrea discuss the language featured. In lesson 31 of Coffee Break German Season 2, Andrea and Mark present the first episode of our radio play. You'll meet the characters Miriam, Carola and Phillip who are sharing a flat together in Munich. Having listened to the radio play you'll then hear Mark and Andrea talk about the language featured in the episode. Welcome to the 30th lesson in the season and it's time for some review. You won't believe how much you've learned in lessons 21-29, and in this episode Andrea and Mark will be reviewing topics such as Wechselpräpositionen, relative pronouns, modal verbs, and much more! CBG 2.29 | Fährst du in die Schweiz, oder fährst du in der Schweiz? Coffee Break German Season 2 is all about helping you "tighten up" your German, and this episode addresses one of the trickiest aspects of German for learners. You're already familiar with prepositions, and you're already familiar with the accusative and dative case, but did you know that there is a group of prepositions which can take the accusative OR the dative, depending on the situation? By the end of this lesson all will become clear and you'll be able to make the correct decision every time with the help of Andrea and Mark. Coffee Break German is the course which teaches you German. Andrea is the teacher who helps Mark learn. You are the student who is learning along with Mark, and this is the lesson in which you'll learn all about relative pronouns in German! We'll learn how to use relative pronouns to combine two clauses together and how relative pronouns work with different genders and cases. All will become clear! In this lesson we're dealing with what, on the surface, seems like a tricky topic: the use of the verb sollen. We'll learn to use the verb in the Present and Präteritum, and we'll learn about the subtle differences of using each tense. Sollen is used to say what someone "should do", or "ought to do", and the key question involves whether or not you're being given advice, a suggestion is being made, or indeed you've already been given orders by someone else (e.g. doctor, teacher, parent, etc.) to do it! Complicated stuff, but we'll help you sort it all out! CBG 2.26 | Kommst du jeden Dienstag mit dem Fahrrad zur Deutschklassen? In this lesson we're tackling a tricky subject for learners of German: word order. In particular we're looking at where adverbs come "inside the Verbklammer". For this we'll be introducing you to a new concept: "Tekamolo". All will become clear in this lesson. It's time to look at reflexive verbs in the past. In this lesson you'll learn to say what you enjoyed, what you complained about and what you looked forward to, and much more besides! Julia is back with a cultural correspondent segment on an area in Italy where German is spoken, Südtirol. CBG 2.24 | Wovor fürchtest du dich? In this episode you'll learn to use reflexive verbs in German. In addition to being able to talk about "washing yourself" and "scratching yourself" (among other things! ), you'll also learn to talk about looking forward to things, relaxing, deciding, catching a cold, getting annoyed, remembering things and complaining! Reflexive verbs are hugely important and this lesson will equip you with everything you need to know! CBG 2.23 | Hilfst du deinen Kindern bei ihren Hausaufgaben? We've already covered the topic of family in Coffee Break German, but in this lesson you'll learn how to talk about your extended family, and deal with possessive pronouns in the nominative, accusative and dative cases. Is it mein, meine, meinen, meinem or meiner? By the end of this lesson, you'll know! So far in Coffee Break German we've learned to use haben, sein and some modal verbs in the Präteritum. In this lesson Andrea and Mark look at other verbs in the Präteritum which are not used commonly in spoken German, but you'll find them in any story you read. You'll also learn about some irregular verbs in this tense, including kommen and gehen, and Julia is on hand to tell us about two very famous German writers: Goethe and Schiller. In this lesson you'll learn to talk about rules and regulations in the past using the Präteritum of the modal verbs dürfen and müssen. By the end of the lesson you'll know how to talk about what you were or weren't allowed to do as a child. This lesson marks the end of the first half of our second season of Coffee Break German. Mark and Andrea take the opportunity to review the topics covered in lessons 11 to 19 with lots of new examples, helping you build your vocabulary and practise the grammar points at the same time. CBG 2.19 | Wie alt warst du, als du Deutsch lernen wolltest? In the last lesson we looked at the Präteritum, the past tense form which is commonly used with verbs such as sein, haben and so on. In this lesson, we'll be taking the Präteritum a little further and learn how to talk about what we wanted to do and what we were able to do in the past, using können and wollen. CBG 2.18 | Wie alt warst du, als du ein Handy gekauft hast? This episode of Coffee Break German introduces the verbs sein and haben and how they are used in the past. In fact, these verbs use a different tense, the Präteritum, or "imperfect" as it is often referred to in English. You'll learn to conjugate the imperfect of sein and haben and how to use it in a variety of situations. In this episode we're focusing on the use of weil with the Perfect Tense and you'll be learning to give excuses as to why you arrived late and why you haven't done your homework! In this lesson we're looking further at the dative case and specifically at verbs which need the dative like geben, schicken, schenken, antworten and helfen. You'll also be learning to use the dative forms of the personal pronouns. ​This lesson focuses on the topic of asking questions, both "open" questions using the W Fragewörter, and more closed questions which are more likely be answered by ja or nein. You'll learn to ask questions using various words, all of which begin with the letter W, and you'll also learn to use reported speech involving questions. Julia is back with another Kulturbeitrag in which she talks about celebrating birthdays in Germany. Learn how to gossip in German! In this lesson we'll be looking at reported speech and how this works with dass. You'll learn how to say who said what to whom, of course using the correct grammatical constructions. Learn how to gossip in German! In this lesson we'll be looking at reported speech and how this works with "dass". You'll learn how to say who said what to whom, of course using the correct grammatical constructions. CBG 2.13 | Wie viel Schokolade isst du jede Woche? ​In this episode of Coffee Break German we'll be learning how to translate "much", "many", "some", "few", and lots more quantifying words - something learners often find difficult. By the end of this lesson you'll be able to talk confidently in German using the words viel(e), wenig(e), etwas, manche, and say how much chocolate you eat, how many glasses of water you drink, or how many portions of fruit you have. In this lesson of Coffee Break German we'll be taking the "dass" structures a stage further and looking at other verbs which can be used in this context. You'll learn to use a number of verbs with this structure and you'll also learn some important rules involving grammar and word order. In this lesson we'll be covering the topic of subordinate clauses. That sounds more complicated than it is! Basically this lesson will teach you how to make requests in German and tell people what you'd like them to do - or not do! Julia is back with another Cultural Correspondent segment and in this episode she's talking about rules and regulations in German-speaking areas. In this episode of Coffee Break German you'll be amazed when you realise how far you've come, as you review everything you have learned so far in Season 2. Andrea and Mark talk about the topic from this unit such as cases and adjective agreements, adverbs, using denn and weil and making sure your perfect tense really is perfect! After listening to this lesson you will be an expert on all the language points covered so far. If you've been following our Coffee Break German lessons you can now use denn to give a reason - ausgezeichnet! However, there is another word which also means "because", and that's weil, and this word brings with it some challenges regarding word order. In this lesson you'll master weil and you'll learn how to use it in a sentence and cope with the word order changes. As usual there will be lots of examples and you can work through the lesson and understand everything. In this lesson of Coffee Break German you'll learn how to give a reason - without having to worry about word order! This lesson introduces the word denn and you'll be delighted to know that it does not change the word order of your sentence. We've dealt with the Perfect Tense using the verb haben, but there are some verbs which need to use sein as the auxiliary verb when forming the Perfect. In this lesson you'll learn which verbs take sein, and how to say where you went, when you woke up, when you were born and how you travelled. It's all about a change of place or state... Listen to the episode to understand everything! In this lesson of Coffee Break German you'll be starting to learn to talk in the past using the Perfect Tense. This tense is formed by using a part of the auxiliary verb haben (to have) and the past participle. Andrea will explain everything you need to know, and you'll soon be saying what you did, what you cooked, what you ate and what you played yesterday, last week and 100 years ago! In this lesson of Coffee Break German you'll learn to talk about your hobbies and pastimes and to say when, where and how often you do these pastimes. This topic will introduce you to the concept of the Verbklammer, the "verb brackets" which surround any adverbs in your sentence. All will become clear when you listen to Andrea's explanations, and you can join Mark and practise your German in this context. In this episode you'll learn to make requests using the correct adjectival forms. Join Mark and Andrea as they look at using adjectives in the accusative case with definite articles. In this lesson you'll be all set for checking into a hotel - and using the correct German grammar to do so! Join Mark and Andrea as they look at the interesting topic of adjective endings in the nominative case with indefinite articles, so you'll be able to ask for "a large room, a comfortable bed and a beautiful view of the mountains"! How many times have you ordered a drink in a German café, or a snack in a German restaurant and you've never been quite sure about whether you're using the correct word for "a" or "the". Of course there's the gender of the word to think about, but the added complication with German is the case! 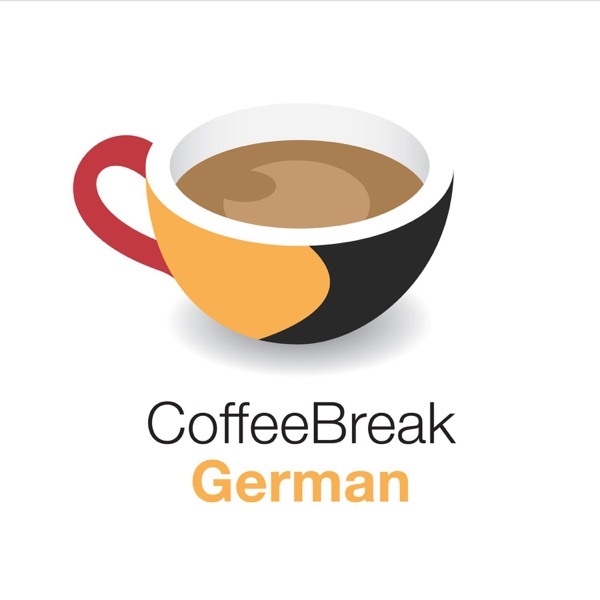 This episode of Coffee Break German focuses on the Accusative case and you'll master how to use this case with both definite and indefinite articles. CBG 2.01 | Ich bin Deutscher, sie ist Deutsche und wir sprechen Deutsch! In this first lesson of the new series of Coffee Break German, join teacher Andrea and her student Mark as they review the topic of nationalities and languages. This lesson introduces the fact that, unlike in English, German normally has a different word for the nationality and the language of a country. You'll also review the verbs sprechen and lernen, and the team is joined by our Cultural Correspondent Julia who's back with more cultural information about the German-speaking world. We have some exciting news to share ... we're delighted to announce that Coffee Break German Season 2 starts on Monday 13th February 2017 with lessons published every two weeks. Join our new teacher Andrea, learner Mark and our cultural correspondent Julia for the regular lessons and take your German to the next level! CBG 1:40 | Mein Deutsch hat sich sehr verbessert! This season of Coffee Break German features a total of 40 episodes. Stay subscribed to the podcast to enjoy each episode. If you'd like to benefit from lesson notes, bonus audio recordings and video versions of the lessons featuring 'synchronised video flashcards' to help you understand how the words and phrases are written, you can access the premium version of Coffee Break German on the Coffee Break Academy. Join us on YouTube where we post regular videos for language learners: subscribe to Coffee Break Languages now! If you'd like to find out what goes on behind the scenes here at Coffee Break Languages, follow @coffeebreaklanguages on Instagram. CBG 1:39 | Wir haben Mark zur Party eingeladen! CBG 1:38 | Haben Sie etwas ungewöhnliches gegessen? CBG 1:37 | Gibt es einen Supermarkt, der am Sonntag geöffnet ist? In this latest lesson of Coffee Break German, Mark is asking for some information at the reception desk of his hotel in Innsbruck. In addition to providing an opportunity for practising various areas of vocabulary, this dialogue introduces a new grammatical concept. CBG 1:36 | Kann ich hier Briefmarken kaufen? CBG 1:34 | Ich lade dich auf dein Frühstück ein! CBG 1:33 | Welch ein Zufall! test your understanding by listening to a conversation. CBG 1:32 | Gibt es einen Bus dorthin? CBG 1:31 | Willkommen in Innsbruck! learn about some famous German speakers. In this special lesson of Coffee Break German, we’re challenging you to identify five personalities by using the German skills you’ve acquired in the courses so far. Listen to the show, enter our competition, and you could win an iPad mini! about some famous German language film. about the Austrian capital, Vienna. about the German capital, Berlin. about the Bavarian capital, Munich. about the German concept of Kurorte which translates roughly as “spa towns”. about the traditions surrounding Einschulung – going back to school – in German-speaking areas. what Schrebergärten, Gartenzwerge and Dauercamper are in our cultural segment with Julia. how Germans like to spend the summer in our cultural segment with Julia. find out about music from Germany and Austria in our Cultural Correspondent segment. how to use separable verbs. and to conjugate the verb sein (“to be”) in the present tense. Julia’s top five things to do in Hamburg. cultural tips for dealing with shopping in German-speaking areas. further useful words and phrases to deal with hotels and accommodation. some cultural informaiton about breakfast traditions in German-speaking areas. how to tip in German-speaking areas. how to use the indefinite article in German in the accusative. about the culture of Kaffeetrinken in German-speaking areas. phrases for greetings at special times of the year. how to conjugate a regular verb in the present tense singular forms. the definite articles of masculine, feminine and neuter nouns in the accusative case. how to ask someone to show you on a map where you are. some useful phrases for dealing with shopping situations in German. how Karneval is celebrated in German-speaking countries. how to greet people in different parts of the German-speaking world. where the German language is spoken. the words for “yes” and “no”, and other useful German words which will come in handy every day. You’ll also meet the other members of the Coffee Break German team: learner Mark is more used to teaching French and Spanish in Coffee Break French and Coffee Break Spanish; Kirsten, our Grammar Guru and self-confessed grammar geek, will be bringing us regular explanations of the trickier aspects of the German language; and Julia, our Cultural Correspondent, will provide the inside knowledge on all things German, Swiss and Austrian. In this introductory episode, Mark and Thomas talk about what you can expect in the first ten lessons of the course which starts this Wednesday, the 23rd of January 2013. The lessons will introduce the basics of the language and by the end of the first group of ten lessons you’ll be able to communicate in basic German with confidence. Topics covered include introductions and greetings, talking about where you’re from, your family, dealing with numbers and paying for things, finding your way around the town and coping with language difficulties.